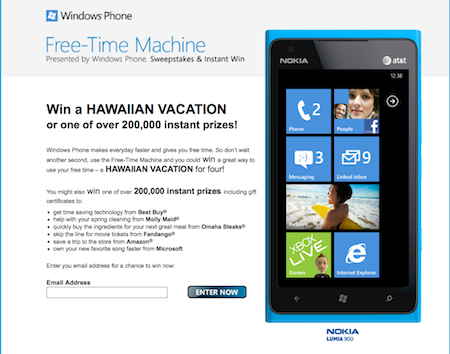 Mobile Phones Fan: Have Fun with Windows Phone, Win a Prize! To enter, you have to play a quick 'Concentration'-style memory game -- simply match up five pairs of active tiles, as shown on a Lumia 900 mock-up (see image, above). ...and everybody who plays gets a free song for their Windows Phone handset, courtesy of Microsoft's Zune Store. Pretty cool. You can enter twice per day, but only from a single email address. What are you waiting for? Go match those tiles and see what you can win. No purchase necessary. Open to residents of the USA, age 18 and older. Contest ends 31 May, 2012.